Disappointing. Underwhelming. Poor. All words that have been bandied about in relation to the British World Championship Trials. Many complained about the stringent qualifying standards that had been imposed, while several high profile swimmers called time on their careers. But was it really as bad as some would have us believe? Sadly, in many places it was, but that’s not to say that it was all bad news, with 10 swimmers booking their trips to Montreal and a couple of British records to boot. The most impressive swim of the week undoubtedly came from Kate Haywood. She now seems to be reaping the rewards of her move to Loughborough and moved the 100m breaststroke British Record on to a new level, posting a time of 1:08.14, in her semi-final. Sadly the pressure of the final got to her as Kirsty Balfour also stepped up a notch posting 1:08.66 to qualify for Montreal. Haywood bounced back in the 50m event to get her team spot and now seems likely to get a swim in the longer event as well. Not so long ago Britain’s women were struggling to break the seventy second barrier so to have two ladies swim under 1:09 in the same week is an encouraging step. Although there’s still some way to go to challenge the Australians and Americans, whose trials were both won in times around the 1:07 mark, both Balfour and Haywood should be seeking a finals spot in the summer. Haywood’s teammate Caitlin McClatchey was another young lady to impress as she improved her best times over 200m and 400m freestyle and set new Scottish Records in both. The Loughborough swimmer dipped under the 2-minute barrier for the first time in the shorter event and took the title in the longer, to book herself an individual swim at the World Championships following her relay outing in Athens. The final woman to qualify was Rebecca Cooke, who booked her place in the 800m freestyle. 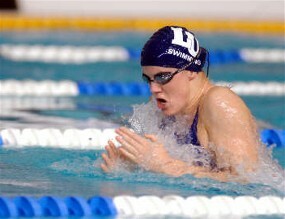 She also set a British Record of 4.46.54 in the 400IM, but was still some way outside the qualifying time. Meanwhile, Melanie Marshall bounced back to near her best form wining the freestyle sprint double and getting near her best times in each. Unfortunately she just missed the qualifying times in each but will have another chance to confirm her place later this year at the Stage 3 meet. She also caused a bit of a stir in the backstroke events, taking the 200m title to hold off 50 and 100m winner Gemma Spofforth. Reigning world champion Katy Sexton will have to wait until May to see if she will be able to defend her title following a below par showing in Manchester. On the men’s side the most impressive group were the backstrokers, with swimmers qualified in each of the distances. Liam Tancock lowered his own British Record to win the 50m sprint, while James Goddard equalled long time adversary Gregor Tait’s British record in the 100m event as he pipped Tait for the win. Their roles were reversed in the 200m though as Tait stole in for the win and his seat on the plane. The breaststroke swimmers went almost as well, qualifying in two events, but were less impressive in terms of the times they posted. Maybe we have been spoiled in recent years with the quality that Messrs Mew and Gibson have produced, so although both qualified this year their times were perhaps slower than we would have liked. Mew took the 100m title while Gibson qualified to defend his world title in the 50m event. Olympic Bronze medallist David Davies was the other man to confirm his selection as he easily won the 1500m title and dipped under the qualifying standard, although his time was almost 20 seconds shy of the European record he established in Athens. Davies and Coach Dave Haller seemed baffled as to why the time wasn’t faster, but he is on the plane and therefore remains a realistic medal chance in Montreal. In some ways it seemed as though some of Britain’s top swimmers were not fully prepared for this meet following breaks in the aftermath of last year’s Olympics. Many of the are targeting qualification at the Stage three meet to be held in May, but there’s also a possibility that some will be following the lead of Olympic Champions such as Ian Thorpe and Amanda Beard in taking a lower profile this year, intending to make a reappearance for the Melbourne Commonwealth games. Only time will tell on that front but first comes that Stage 3 meet, when British swimmers from US colleges will be back, and the team will hopefully increase in number.